Louisiana shooter: John Russel Houser of Alabama, a 59-year-old staying at a motel. 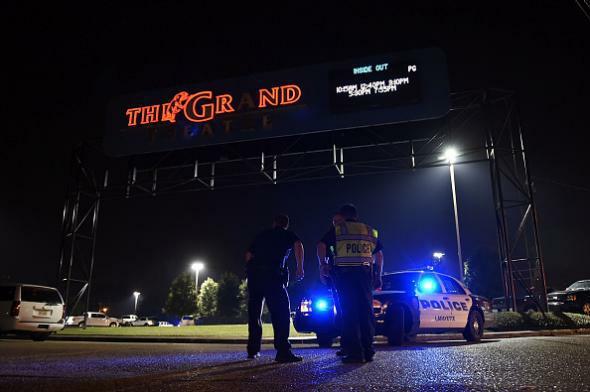 Police outside the Grand Theater in Lafayette, Louisiana, on Thursday. Houser was “kind of a drifter” who had been staying at a Motel 6 in Lafayette since the beginning of July but apparently had few ties to the city, Lafayette Police Chief Jim Craft said … Houser, who shot himself as he saw the first Lafayette police officers enter the theater, apparently was going to try to escape from the shooting scene: Craft said wigs and other material for “disguises” were found in his motel room. He had also switched the license plates on his car. Houser was from Phenix City, Ala. He had been staying at a Motel 6 on University Avenue in Lafayette since the beginning of the month, Craft said. He appeared to be estranged from his family, and the only real tie Craft said they’d found to Lafayette was a deceased uncle who lived here decades ago. ABC says Houser’s 1995 Lincoln Continental was “positioned” near the exit of the theater, apparently to facilitate an escape. Craft, the Lafayette police chief, said Houser had a record of arrests for charges such as arson and providing alcohol to a minor but had not had any run-ins with law enforcement in the last 10 to 15 years. Houser fired at least 13 shots during his attack, police said. *Correction, July 24, 2015: This post originally misspelled John Russell Houser’s name.